The welcoming Hilde Moser maintains a lovely, well-kept house which offers panoramic views and many local, homely features. Located close to the village centre. Breakfast/sitting room; terrace. NB. The guesthouse does not have a lift. 3 room apartments for 2-5 persons (2 separate bedrooms and bathrooms and fully equipped kitchen/diner with microwave, hot plates, coffee machine and fridge) have shower, balcony or terrace, cable TV, safe and hairdryer. We update Haus Edelweiss Apartments's details often, but facilities do change. e.g. some extras listed by the supplier as "free" or included might only be for the first time you use them, or for one time per party, then charged for further use. If any specific feature is essential to your holiday, make sure you ask us to confirm the details of it before you book your holiday. This accommodation only holiday to Haus Edelweiss Apartments in Alpbach, Austria departs Wednesday 11th September 2019, for a 3 night stay on a "self catering" board basis. A local tourist tax (Taxe de Sejour or Kurtaxe) is levied by many councils in European resorts. It varies by standard and type of accommodation and is age dependent, so not everyone is charged. It's not included in the basic price of your holiday and is usually paid locally. For reference, the average charged in winter 15/16 was between 50p and £2 per person, per night. 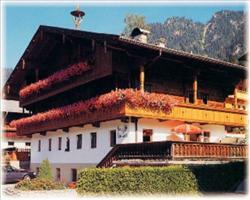 Haus Edelweiss Alpbach Austria, Accommodation only to Accommodation only 11th September.